I just don’t get these tax protests. Mum is the word for 7 years while over a trillion dollars is spent in and on Iraq, but when the money is being spent domestically, people stage protests. Protests sponsored by a news organization. I think someone has been duped. Posted on April 15, 2009 Categories blahblah1 Comment on Now you’re upset? I re-clipped the hens wings in an effort to keep them in the run during the day. The idea is that they’ll be less likely to get out of the run and poop all over everything. Especially the back steps and the patio. Neither of the Jersey’s are as bad as Layla about flying out, but one of the two can often be found out roaming. Layla, on the other hand is rather contrary and even after clipping both wings (this time), I found her out and about the next morning. She pooped right dead center on the patio in what I can only assume is her method of registering her disapproval of the clipping. On Friday night my dad and I moved this finished dresser in to Ella’s room. It took roughly 3 months to build due to some distractions, but Ella (and Michelle) are happy to see a finished product finally sitting in the room after many afternoons over in my dad’s shop. So the second version was much better (below), though my dad made some design changes based on things he’s learned since building the originals, and based on access to certain materials. 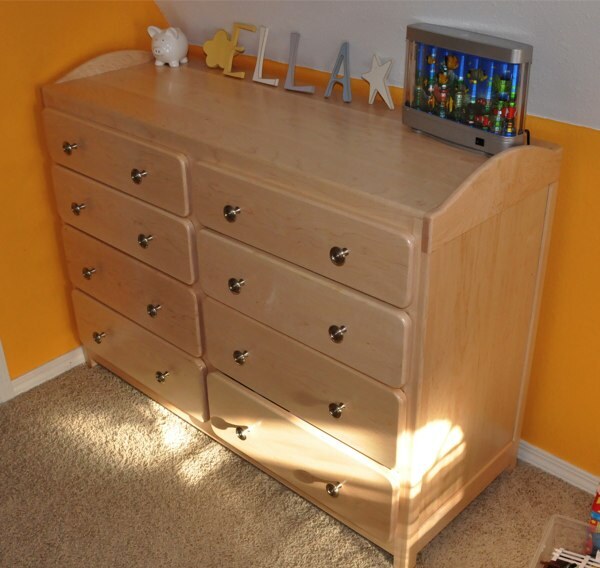 The original dresser had a bunch of birdseye maple in it that he got on the cheap from a cabinet shop in Yakima. To get even enough birdseye for the top of this project would have tripled the price. So we went with a nice-enough selection of rock maple (some with great figuring) and used Pacific Coast maple and some poplar for the innards. This is the first project like this that I’ve been involved in from start to finish, so I was taking every opportunity to learn from my dad. 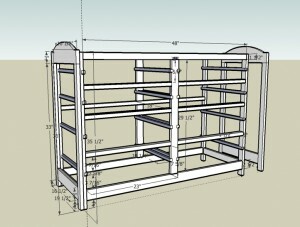 He also took the opportunity to not be sold on sketchup for design, since it seemed that we were correcting mistakes at every point of the project. I blame this more on my creating a plan and his modifications of it, so we had no single accurate plan at any given time. 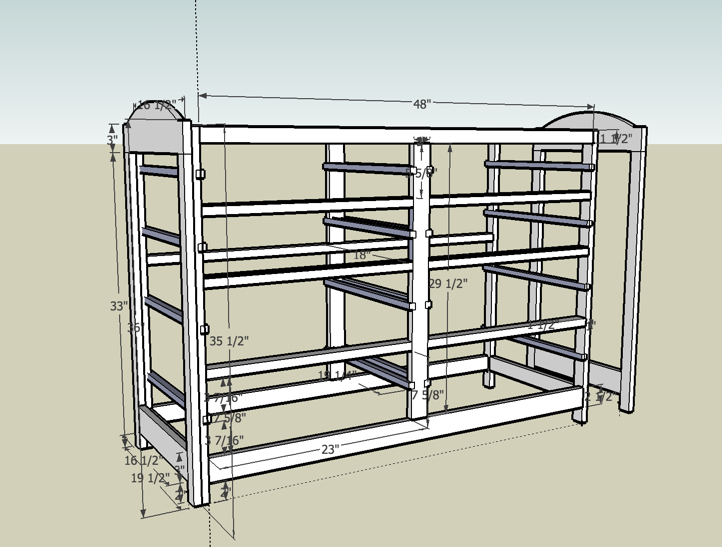 I also learned from some bone headed mistakes, like if you modify the height of the piece, you have to redraw all the drawers if you don’t use sketchup like a pro. Needless to say, I learned one of the most important things in woodworking – how to back out of a problem. It was a little frustrating that it took so long (I’m sure my dad would agree, since it was holding his shop hostage), but I had a lot going on at home. And when I tried to rush in some work, I often made the biggest mistakes. But I also got to learn to use his shop and the process from design, to purchasing the wood, to planing and cutting boards, assembly, and finishing. I’d done individual parts in the past, but never all as one project. Having made the piece, I can see all the flaws and errors, though they’re relatively minor. Hopefully it isn’t obvious to Ella and she decides she’d rather have IKEA stuff for the rest of her life. It was a lot of fun, and I’m hoping to find another project to do soon. Right after my thesis. Michelle and I took full advantage of the glorious weather to work the yard in to shape. We also added a third raised bed in the front yard, which Michelle agreed to with some trepidation. It’ll be nice to have another bed that gets more sun and won’t be as likely to have heirloom tomatoes plucked by passer-bys. This evening after a second full day of yard work, we decided a walk to Pause was in order. On the walk there, we discovered that the two warm days was enough to get the ants out, and we passed through hatch after hatch of flying ants. The patio at Pause was even getting swarmed, but I seemed to be taking the brunt of the, well, nuisance. The nuisance quickly turned in to sheer terror when one ant landed on my ear lobe and crawled up and in to my ear canal. A quick finger after him wasn’t enough and he crawled in to some place that tickled like hell. The movement somewhere that only water and wax goes was the stuff of childhood nightmares. The tickling was roughly where my jaw hinged, and it was not normal. For the next 4 minutes I thrashed my head around, used my finger to suction and plunge, and finally flooded my ear with water. That seems to have done the trick, though I kept having to remind myself that the ear was a closed-enough system that nothing could go too wrong. Still, I hope that never happens again.